DAY 01 | WELCOME TO CUSCO! Welcome to Peru! Upon arrival to Cusco, you will meet your representative at the airport and be transferred to your hotel. After check in, jump right into your Peruvian Adventure! 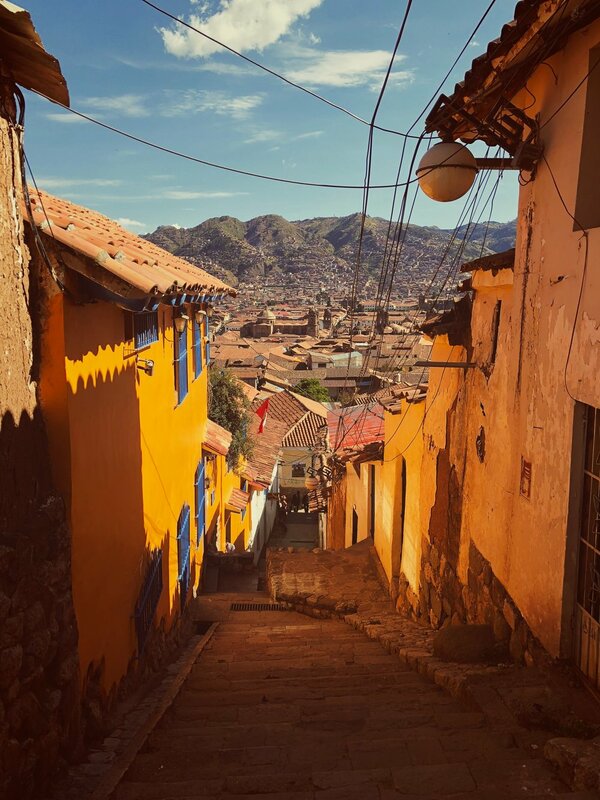 Get to know the city of Cusco, an UNESCO World Cultural Heritage site and possessor of a style all its own. Today’s tour begins at the Koricancha Temple, an old Incan palace and main center for the worship of the sun god, Inti. Once the Spanish conquered Peru, the Dominican order built a lovely church over top this temple’s foundations: the church of Santo Domingo, that is still there today. Your next destination is the Main Square, upon which sit the Cathedral, the beautiful Church of La Compañia de Jesus (Society of Christ), and other Colonial period buildings. The adventure continues to the Sacsayhuaman Fortress built of enormous stone blocks expertly shaped by the Incas. It is strategically located at the top of a hill overlooking the city of Cuzco. What a view of the city! The tour ends with visits to three archeological sites: Qenko, Puca-Pucara, and Tambomachay, important religious and administrative centers for the Incas. This evening is yours to explore the city or relax after a long day. Enjoy a hearty breakfast at the hotel. Today, you will enjoy a Full Day Trekking of the stunning Rainbow Mountains of Vinicunca with lunch included. Vinicunca, also known as the Rainbow Mountain, is an amazing natural formation shown along the mountain ranges of the Vilcanota Mountains. The Ausangate Mountain in that range is considered in the Andean world as the Holy Mountain or Mountain Spirit, and since pre-Inca times has been a place of veneration and worship, a tradition that continues to this day. Walk towards the Rainbow Mountain, a place that was once visited only by an expedition of 5 days, and is now reachable in just one day! Walk on this route at 4000 MASL and along the way you can enjoy extraordinary landscapes, small communities, typical flora and fauna of the area, with a backdrop of the Ausangate Snow Mountain at all times. The Ausangate Snow Mountain is the highest in Cusco region (6,385 MASL / 20,945 ft.). This evening is yours at leisure. After breakfast and check out at the hotel, you will begin a full day tour through the magical Sacred Valley, Pisac Market and Ollantaytambo ruins. Enjoy a wondrous, scenic drive to the Urubamba Valley, the "Sacred Valley of the Incas". En route, stop at Awana Kancha and discover the beauty of South American camelids, guanacos, llamas, vicuña and alpacas, and an exhibition of traditional Andean textile art. Arrive to the town of Pisac, an hour drive from Cuzco, to visit the colorful Pisac Market, where local indians meet to sell their merchandise as they’ve done for centuries. There is also a handicraft market. The tour continues to the town of Ollantaytambo, where you will climb its imposing Inca fortress at the top of the mountain. Lunch will be provided at a local restaurant. Enjoy an evening on your own in the Sacred Valley. Enjoy an early breakfast before checking out of your hotel. Today is an entire day dedicated to Peru’s most famous feature - Machu Picchu. Arrive to the Aguas Calientes Station in Machu-Picchu, where you ill transfer by bus to the top of the mountain and visit the citadel of Machu-Picchu, one of the most renowned examples of Inca architecture, surrounded by lush cloud forest. Lost in history, it was not discovered until 1911 by the American explorer Hiram Bingham. After a guided visit of the ruins, you will have lunch at local restaurant. After the tour you will head to your hotel for the evening in Aguas Calientes. Tonight is yours to relax and reflect. Have an early breakfast at the hotel before checking out. Enjoy personal access to Machu Picchu with bus transportation included, in order to discover more of this incredible site at your own pace. Later on, you will descend to Aguas Calientes and, board the return Vistdadome train back to Cusco, stopping at the Ollantaytambo Station to be picked up and driven to your hotel in Cusco. Upon arrival, you will be welcomed at the airport and driven ten minutes to the Puerto Maldonado headquarters. Here, you will stop to not just enjoy the views, but also to pack only the necessary gear for the next few days. Leave the rest at the headquarter’s safe deposit. This helps to keep the boats and cargo light en route to the Amazon Lodge in which you will be spending the next two nights. Skirting Puerto Maldonado, drive 20 kilometers to the Tambopata River Port, entering the Native Community of Infierno. The port is a communal business. The two and a half hour boat ride from the Tambopata Port to Refugio Amazonas will take you past the Community of Infierno and the Tambopata National Reserve´s checkpoint and into the buffer zone of this 1.3 million hectare conservation unit. Boxed Lunch Onboard. Enjoy dinner this evening at the lodge. Afterwards, head out to the river’s edge, scanning the nighttime shores with headlamps and flashlights to catch the red gleams of reflection from caiman eyes. This morning, paddle around the lake on a canoe or a catamaran, looking for lakeside wildlife such as hoatzin, caiman and hornerd screamers, hoping to see the otters which are infrequently seen here. You will also be rewarded with overhead sightings of macaws. A thirty minute walk from Refugio Amazonas leads to the 25 meter scaffolding canopy tower. A bannistered staircase running through the middle provides safe access to the platforms above. The tower has been built upon high ground, therefore increasing your horizon of the continuous primary forest extending out towards the Tambopata National Reserve. From here views of mixed species canopy flocks as well as toucans, macaws and raptors are likely. Lunch will be enjoyed at the lodge. Five minutes downriver from the lodge lays a farm owned and managed by charismatic Don Manuel from the neighbouring community of Condenado. He grows a variety of popular and unknown Amazon crops - just about every plant and tree you see serves a purpose. Along this trail you will find a variety of plants and trees that are used by the local population with at least the same variety of purposes. Learn about the medicinal (and other) uses of Ajo-Sacha, Yuca de Venado, Uña de Gato, Charcot-Sacha, Para-Para, among several others. Dinner at leisure at the lodge. Consider taking part in one of the lodge’s nightly lectures prepared by the staff of Refugio Amazonas which cover conservation threats, opportunities and projects in the Tambopata National Reserve. Enjoy your final breakfast at the lodge before your morning transfer to the airport to catch your flight to Lima. Here, you will be greeted and taken to your hotel. This evening is yours to explore the city a bit more or rest up for your trip back home tomorrow. Perhaps consider making reservations through the concierge at one of this foodie city’s top restaurants. Have an early breakfast at the hotel in order to take advantage of a half day city tour of the colonial and modern sides of Lima. This guided visit to Lima allows you to see the Historical Center: Plaza Mayor ("Main Square"), the Government Palace, the Archbishop's Palace, the City Hall and old streets with colonial mansions and Moorish balconies. You will also visit an historic convent, an icon of colonial architecture. The tour goes all the way to modern districts of San Isidro and Miraflores, where you’ll appreciate huacas or sacred Inca structures while observing the Pacific Ocean coast from the vast seafront. At the appropriate time, you will be transferred to Lima International Airport for your flight back home.